Debi has been constructing unique garments and sharing her passion for quilting for more than 30 years, blending piecing, fabric weaving, machine embroidery and serging to create inspiring masterpieces. 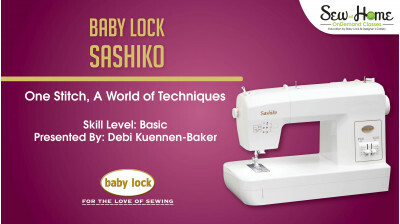 Her Baby Lock Sashiko machined garments have been featured in six Fairfield/Bernina Fashion shows, and her popular teaching style has put her in high demand at sewing and quilting conventions nationwide. In addition to teaching, she’s published her own book, Binding Made Easy, and her work has been featured in several books and magazines.